Around a dozen protesters, including a Tufts professor, several Tufts students and activists not affiliated with the university, assembled for more than an hour on Friday in front of the Steve Tisch Sports and Fitness Center to protest the presence of a Raytheon Company booth at the Tufts Spring Career Fair. 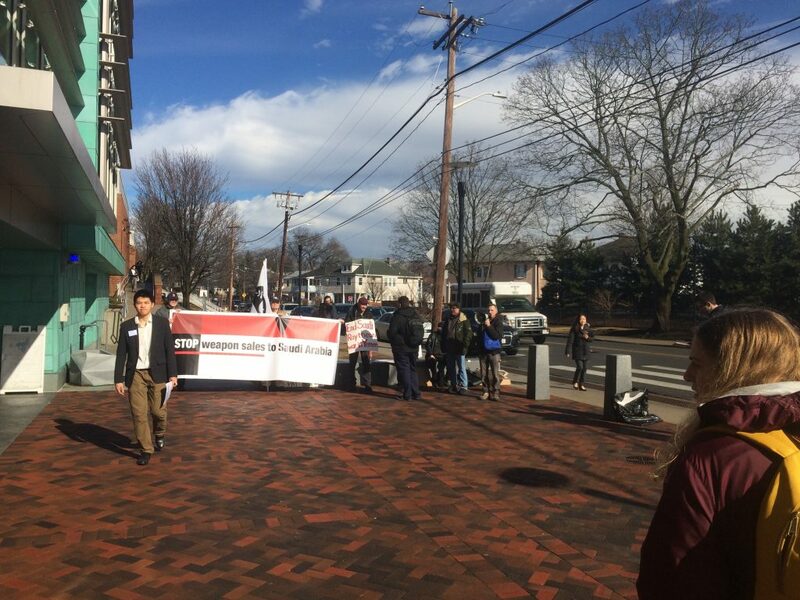 The protest, which was organized by Massachusetts Peace Action, Massachusetts Peace Action Next Gen and the Coalition to Stop the Genocide in Yemen, distributed flyers to passing students and held a banner that read “STOP weapon sales to Saudi Arabia,” while one of the demonstrators with a bullhorn inveighed against Raytheon, a Waltham, Mass.-based defense contractor. The company produces a variety of military weapons systems, such as missiles and targeting systems. The protest came as part of a series of protests by Massachusetts Peace Action which also took place at the Massachusetts Institute of Technology (MIT) and are scheduled to occur at University of Massachusetts Amherst, according to the flyer being distributed by the group. The Coalition to Stop the Genocide in Yemen has protested against Raytheon at MIT, Northeastern University and Boston University in recent weeks, according to its Facebook page. Gregory Victory, executive director of Career Services at Tufts, told the Daily in an email that the Career Center works to provide students with a broad range of options and that the presence of an organization at an event should not be considered an endorsement of that organization. “The Career Center consistently encourages students to do their due diligence to select opportunities that best align with their personal interests and values,” Victory said. Ryan Costello, a member of the Coalition to Stop the Genocide in Yemen, told the Daily that the protesters had three demands: for Tufts to stop inviting “war profiteers” like Raytheon to campus, for Tufts to release the details of the university’s financial relationship with such companies and for the university to cut ties with Saudi Arabia and the United Arab Emirates (UAE). Saudi Arabia and the UAE have led a military intervention in Yemen since 2015, backing government forces against Houthi rebels. Weapons manufactured by Raytheon, specifically the MK-82 and MK-83 bombs and the Paveway II guided bombs, have been used by the Saudis in Yemen, and these weapons have been specifically traced to the deaths of civilians, according to a CNN report. Raytheon had not responded to multiple requests for comment by press time. Gary Goldstein, a professor of physics and astronomy who was protesting, decried Raytheon’s contribution to the crisis in Yemen and said he hoped the protest would open students’ eyes to the situation. Tufts’ Executive Director of Public Relations Patrick Collins wrote in an email to the Daily that the university respects the right of the student groups to exercise their free speech but did not comment specifically on the university’s relationship with Raytheon, Saudi Arabia or the UAE. “Tufts has a long and deep commitment to global relations, and has developed many educational and research relationships around the world to share knowledge and solve local and global challenges,” he said, echoing comments he made to the Daily in a Nov. 16 article. Collins said that these international relationships had helped advance research and educational access and that Tufts remains committed to global engagement. Tufts has historical ties to Raytheon; the American Appliance Company, the precursor to Raytheon, was founded by Tufts alumni Vannevar Bush (A 1913) and Laurence Marshall (A 1911) in 1922. Bush and Marshall both served on the Tufts Board of Trustees. From 1970 until 1980 the Chairman of the Board of Raytheon Charles F. Adams served on the Tufts Board of Trustees and also served on the The Fletcher School of Law and Diplomacy Board of Visitors for 20 years. The scholarship that bears his name continues to fund Fletcher School students every year. Tufts University, according to federal data analyzed by the Associated Press and published in an Oct. 30 report, has benefited from some $41.9 million in donations from the Saudi Kingdom and government-owned Saudi entities between 2011 and 2017. Tufts received the third largest amount of any American university. Emily Colwell, a senior who participated in the protest, said that she did not expect the university to change its investments or other behaviors in response to the protest. “It’s about being aware and individually responsible enough to consider the role you play in institutions to which you belong,” Colwell said. The demonstrators never numbered more than 12, and Thomas Chang-Davidson, a sophomore who visited the booth, said he did not notice the protest. He added that he did not know much about the company, and when he spoke to one of the representatives he discovered they were not offering jobs in his field. Elliot Lam, a sophomore who visited the booth, gave a similar explanation. “As an undergraduate, I think it’s important to get experiences everywhere,” he said. Lam said he saw the protesters but did not know there was a connection to the Raytheon booth. In any case, Lam said he does not see himself working at Raytheon. The protesters, who were present from around 12:15 p.m. to 1:30 p.m., did find some success in reaching out to students. Zoe McKeown, a first-year, spoke with the protesters while walking in front of the gym and expressed support for their cause. Noah Richter contributed to the reporting of this article.